"This is a crowd pleaser. Easy to make, but needs to be chilled for several hours." Mix flour, pecans, and margarine in a bowl. Press dough into a 9x13-inch baking dish to form a crust. Bake in preheated oven until golden brown, about 30 minutes. Allow crust to cool completely. Meanwhile, heat blueberries, sugar, cornstarch, and 1 teaspoon lemon juice in a saucepan over medium heat until berries burst and juice thickens, about 10 minutes. Allow blueberry sauce to cool completely. Beat cream cheese until fluffy. Add sweetened condensed milk and blend well. Stir in 1/3 cup lemon juice. Pour cream cheese filling into cooled crust and spread blueberry sauce over cream cheese. Chill in refrigerator for at least 2 hours before serving. I zested my lemons before I juiced them and added that to the cream cheese mixture. Yummy! It fit nicely in a 9" pie dish. Delicious! 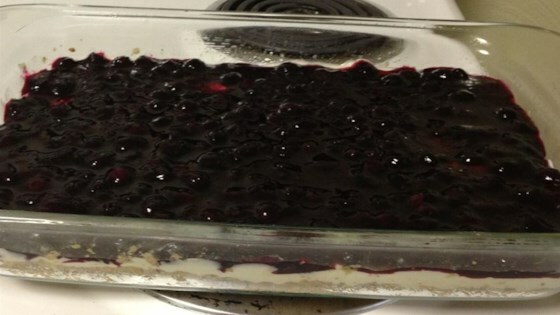 I used fresh huge blueberries, cut back on the sugar a little for the crust, used 1/2 can sweetened condensed milk. Would make again!